The 2-1/2 inch Cordless Premium Faux Wood Blind by Home Decorators Collection brings efficiency and chic to your home. 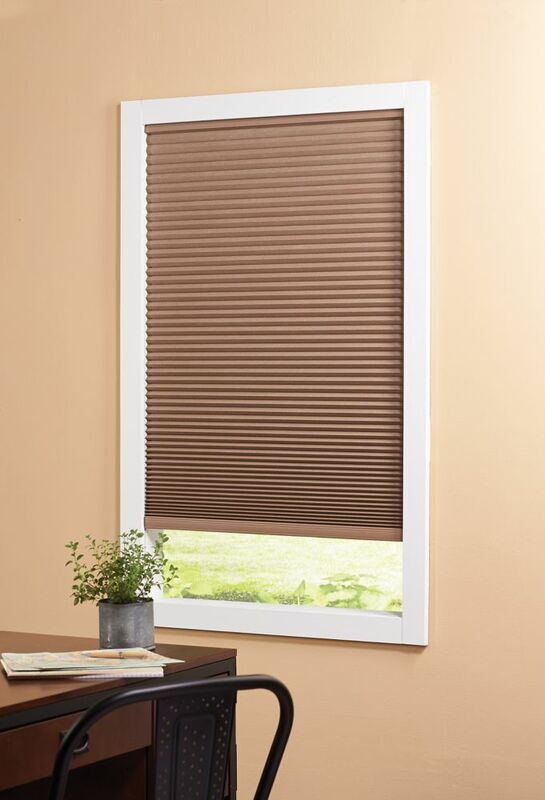 Cordless blinds adds a cleaner look and are child safety cautious. These blinds are designed with 25% larger slats for greater view and features "no hole" for total light and privacy control. Slats are made from heat and moisture resistant material that are energy efficient and will not warp or crack. They are ideally used for bathrooms, kitchens, and garages. For a contemporary style the blinds include a 3inch decorative crown valance that complements any decor. Cordless Blackout Cellular Shade Dark Espresso 36-inch x 72-inch (Actual width 35.625-inch) The right window shade can refresh your room with light and colour. When making your choices, be sure to think about how much light you need. A light filtering cellular shade will filter light gently into your space, while a black out cellular shade will stop unwanted brightness. You'll also want to consider tone and texture. What shade will complement your furniture, floor coverings and wall colour? Cordless Blackout Cellular Shade Dark Espresso 36-inch x 72-inch (Actual width 35.625-inch) is rated 3.0 out of 5 by 2.